Shortly after we found out that Google was to purchase Beat That Quote we highlighted how Google purchased a website that was deeply engaged in numerous nefarious black hat SEO practices. 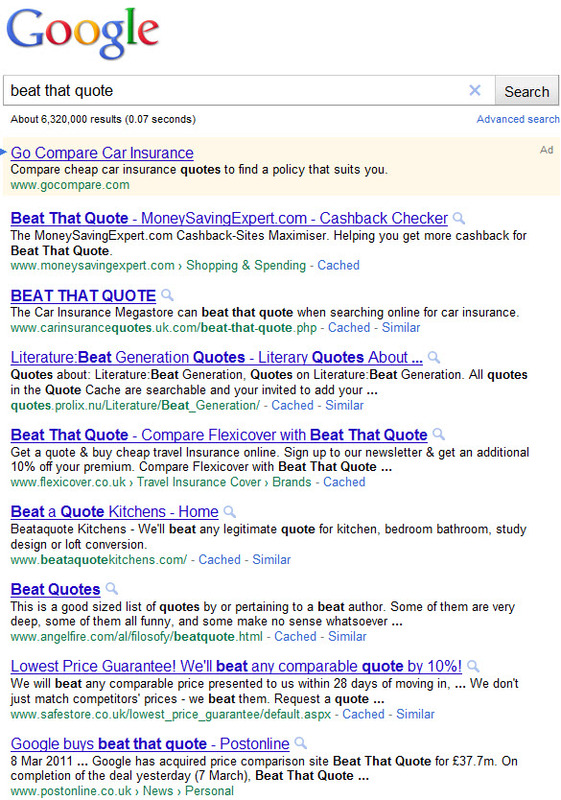 A friend just pinged me to confirm that Google has penalized the domain by removing it from the search results. From a competition & market regulation perspective that was a smart move for Google. They couldn't leave it in the search results while justifying handing out penalties to any of its competitors. As an added bonus, the site is building up tons of authoritative links in the background from all the buzz about being bought by Google. Thus when Google allows it to rank again in 30 days it will rank better than ever. Based on their web dominance which generates such a widespread media buzz, Google adds millions of Pounds worth of inbound links to any website they buy. The message Google sends to the market with this purchase is that you should push to get the attention of Google's hungry biz dev folks before you get scrutiny from their search quality team. After the payday the penalty is irrelevant because you already have cash in hand & the added links from the press mentioning the transaction will more than offset any spam links you remove. Month 1 revenues might be slightly lower, but months 2 through x will be far higher. Start a rumor that your domain is being bought by Google. I just don't know why they will buy them out and help them build backlink with all this buzz and come back stronger then ever..not smart. "Google, Pick Me, Pick Me!" I kinda agree with @mcgelligot, starting the rumor will get some buzz worked up. The amount of Gaming that seems to be going on never fails to disgust. social signals into the mix with search via FaceBook, since we've ruined the goodwill of websites. Problem is that when celebrities like Katy Perry gets paid 10K per tweet. I think the prospect of trying to beat scammers using the social graph is going to fail, miserably as well, then we can stop trusting each other as well. I think Google should employ facecam recognition on all screen. When ever a surfer rolls there eyes in disgust or unhappiness, or smashes the keyboard, or similar biometrics..a signal should be sent to the offending site, nuking them into oblivion. Until that day comes hopefully soon. I have to try to out think the SEO who's posting endless crap to rank sites, so I can get a decent search result when I need something. The only ranking that seems matter these days is the fresh smell of offending sites. Keep up the great work Aaron. Just got penalized by Google. R U buying us, big G? They were only penalized for 2 weeks! Yet it looks like JC Penny remains penalized. "Thus when Google allows it to rank again in 30 days it will rank better than ever. " So you are saying that when a site is removed from SERP, the ban is removed in 30 days ? Or they have to resubmit for consideration and only then will appear on SERP in 30 days ? a bit facetious toward Google...saying they would make their own site rank right away again & that the penalty would be a token slap that is quickly remedied. As it turns out, my guess was too conservative & they allowed the site to rank again after only 14 days (even without fixing any of the flagrant paid links). I then made a post about that & they once again penalized it.